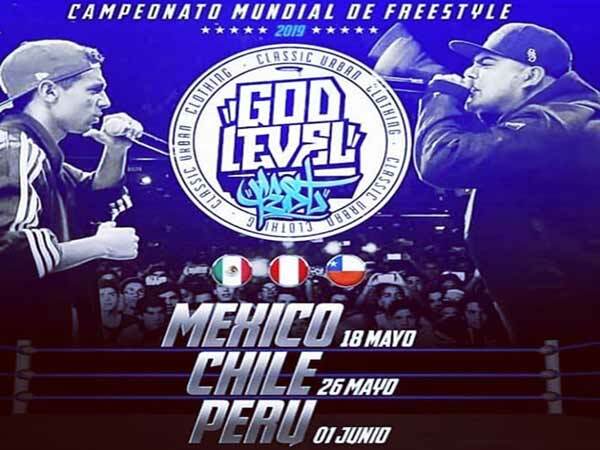 Great news for all hip-hop lovers in Peru: the finals of the God Level Fest 2019 - Freestyle Rap World Cup, are held for the first time ever in Peru at the beginning of June. Since its beginnings in 2014 the God Level Fest has become one of the most anticipated and important events in the Latin American hip-hop community. The annual mega event which has seen the participation of popular and recognized international artists as well as newcomers in previous editions, this year is comprised of 8 country teams each with 3 hip-hoppers that fight for the title. The official host is Darío Silva “Misionero”. The God Level Fest 2019 includes three shows: one in Mexico on May 18, one in Chile on May 26 and the grand finale in Peru on June 1.